Soon after the Grammy's Sunday, a tumblr blog popped up, asking a question many on twitter wanted to know: "Who is Arcade Fire?" (http://whoisarcadefire.tumblr.com/ ) The site has been collecting tweets on the subject of the band's Album of the Year win for days now. Many tweets even thought the band's name was The Suburbs and the album that won was called Arcade Fire (it's the other way around). Still more thought Lady Gaga was robbed. But, as Arcade Fire says on "The Suburbs:" "The music divides us into tribes. You choose your side; I'll choose my side." So, who is Arcade Fire? Here is our quick guide to this year's Grammy winner. Label: Merge Records, an independent label based in Durham, N.C.
Members: While Win Butler and his wife Régine Chassagne are the most visible members of the group—Butler does most of the lead vocals with Chassagne singing backup and lead on some songs—Arcade Fire is made up of five other permanent members, Will Butler, Richard Reed Parry, Tim Kingsbury, Jeremy Garaand Sarah Neufeld. However, the size of the band fluctuates on each record and tour, based on instrumental needs. 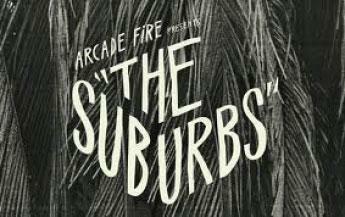 Albums: Arcade Fire's major releases include 2004's "Funeral," 2007's "Neon Bible" and 2010's "The Suburbs." By the numbers: Many of the tweets on the "Who is Arcade Fire?" blog questioned the legitimacy of Arcade Fire's Grammy win based on the fact they hadn't heard "Ready to Start" on their local top 40 station. One tweet asked, "Have they even had a number 1 hit?" However, Arcade Fire does have numbers to back up their Grammy. When "The Suburbs" was released in August, the album hit No. 1 on the Billboard Hot 200. "Neon Bible" had charted at No. 2. Music website Pitchfork named "Funeral" as their No. 2 album of the 2000s. All three albums have sold hundreds of thousands of copies, a feat in the free-downloading era of the record business—especially for releases from a band on an independent label. If that's not convincing enough, Arcade Fire has filled Madison Square Garden and played with David Bowie, David Byrne and Bono. They'll also be headlining music festivals Bonnaroo and Coachella this year. About the music: Arcade Fire has been heralded as saviors of modern alternative music, indie darlings and art rockers. But whatever the category, the band's unique blend of so many instruments—accordions, a hurdy gurdy, guitars, grand piano and more—gives Aracade Fire the ability to produce unlikely anthems. Butler and Chassagne add to the general din of an Arcade Fire song with vocals both haunting and truly fun. They sing about politics, love, family and on this most recent effort, living in suburbia. Arcade Fire's soundscapes grow and change as a song progresses, more like a concerto than a radio hit. Just as a song has been scaled back to simply a voice and a piano, the drum beat kicks in with strings to build it back up. And at a honking 16 tracks, "The Suburbs" is full to the brim with movement from catchy hooks to cinematic word painting. What to listen to from "Funeral:" "Wake Up," "Neighborhood #1 (Tunnels)," "Rebellion (Lies)"
What to listen to from "Neon Bible:" "Keep the Car Running," "No Cars Go," "Black Mirror"
What to listen to from "The Suburbs:" "Rococo," "Ready to Start," "Sprawl II (Mountains Beyond Mountains)"